Every luxurious suite in the Mahana has a direct oceanfront view with massive floor to ceiling windows. You are less than 50 feet from the ocean so every day you'll wake to the delightful sound of waves lapping the beach. Studio, 1 bedroom and 2 bedroom units, each with full kitchen and washer/dryer. Free parking and free Internet access in each unit. Aston Mahana at Kaanapali is consistantly rated among the top five hotels and condo-resorts in the Kaanapali and Lahaina area. Oustanding Oceanfront views, quiet location but nearby the busier resorts and large well maintained units. With over 1700 reviews on TripAdvisor, 93% of reviewers recommend The Mahana at Kaanapali. The views at the Aston Mahana at Kaanapali are simply spectacular. 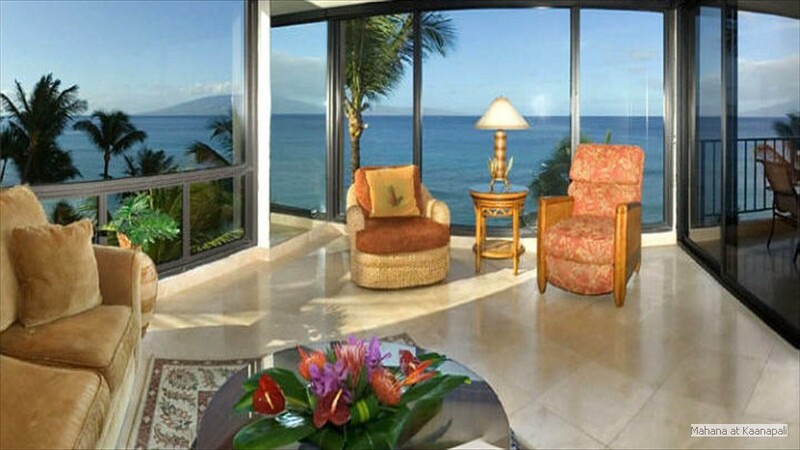 Each suite features floor-to-ceiling windows and a private lanai facing the ocean, where you can sip your favorite beverage and take in the magic of a Maui sunset. From this vantage point, you might also be able to spot the dolphins, turtles and stingrays that inhabit the colorful reef just offshore, as well as humpback whales from December to April. Swimming and some of the best snorkeling on Maui is a 3 minute walk (130 yards) south of The Mahana. Those who love long, quiet walks on the beach will find the Mahana ideal, with over one mile of beach directly to the south. The stunning West Maui mountains are right out your back door. Nearby restaurants including Duke's of Maui, the Beach Club Restaurant at Kaanapali Shores, five other restaurants and a grocery store are within a 6 minute walk.